on behalf of Ellis Jennings Jr.
Bronzeville is a neighborhood that was once considered the Harlem of Columbus. Since the building of I-71 cut the area off from downtown, and I-670 chopped it into several separate neighborhoods, the once thriving region has suffered extensively. The area now has 6x the crime rate of other neighborhoods in the city with 40% of it's residents below the poverty line. Recent efforts have been made to revitalize the area and to bring businesses back to the Near East neighborhood. 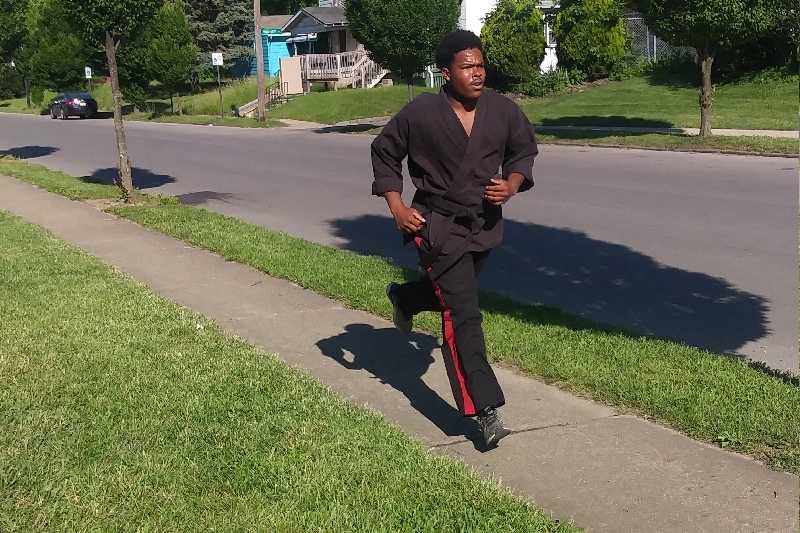 Mr. Ellis Jennings Jr. (Sensei EJ) and his Warrior Karate Academy are part of the life that is slowly moving back into this historic neighborhood. EJ’s Warrior Karate Academy was founded in January 2013, as a school that is devoted to the betterment of self and community. The karate academy is committed to developing character, confidence, self-respect, discipline, honor, benevolence, justice, and courage. These virtues represent Bushido, the Way of the Warrior. The academy is run by Mr. Ellis Jennings Jr. (Sensei EJ) and is dedicated to providing opportunities for youth in the Columbus area generally and in the South side of the city specifically. The confidence, discipline, focus, and creativity fostered through martial arts training has benefits far beyond the karate mat. Training at the Warrior’s Karate Academy combines traditional Shorin-Ryu karate with practical self-defense skills. Students also receive training in situational awareness and managing confrontations. Classes are held 7 days a week by Sensei for both beginning and advanced students. The dojo currently includes 3 black belts, 4 brown belts, and assorted students at lower belt ranks. Philosophy is also integrated into the classes, through “words of the week”, where students are asked to write about the meaning and personal significance of words related to the bushido code and then discuss them together as a group. The vision for EJ’s Warrior Karate Academy comes from Sensei EJ’s own experiences, first from his training as a child at the Bushido Karate Academy founded by Sensei Al McDonald (RIP) and then returning to martial arts training as an adult. Sensei EJ earned a brown belt at the original Bushido Karate Academy, qualifying for the National Karate Championships. However, the Bushido Karate Academy folded and he was not able to compete in the Nationals due to lack of funds, which was a huge disappointment. Sensei EJ continued his training at Rick Moore’s Karate School, where he earned his black belt (3rd dan). After returning to martial arts following a period of missteps and rebellion, Sensei EJ knows firsthand the pitfalls and challenges facing inner city and minority youth, and the benefits that martial arts can bring to help withstand these challenges. Of the current students in the dojo, over 95% are minority, and many are economically disadvantaged. The Warrior Karate Academy is a registered non-profit, and since the academy's inception, Sensei EJ has taught over 2000 children in varying capacities, not only within his own dojo (25 students), but in numerous community programs in the Near East including both Holton Community & Milo Grogan Rec Centers, Neighborhood House, Brian Muha Run the Race, King Arts, Kids Outside the Box, Mother’s Helper Childcare, Champion Middle, Fairmoor Elementary, Columbus City Prep for Boys, Freedom Schools, Kids Connect Afterschool and Summer camp, Project Redeemed, Shepard Academy, Allegheny Headstart, Parent Self Defense, CDC Headstart, Independence High, and the George Reese Summer Camp. Sensei also runs his own camps over all school break periods (winter, spring, and summer). The summer program not only provides karate training and care for the younger children, but also serves as a food program for families who rely on the "free breakfast and lunch for all" program that is run by Columbus City Schools during the academic year. The food provided by the camp is the only source of food for some of the children that attend the summer camp. Part of helping students to follow the bushido code both in and out of the dojo is continuously providing goals for them to strive toward, mainly in the form of tournaments. EJ's students regularly compete in tournaments both regionally and nationally. In 2016, the three top students , who were all brown belts at the time, competed and placed in the Ohio State Qualifier and went on to compete in Richmond, Virginia USA Taekwondo Nationals sparring divisions earning Gold in Men’s Heavyweight (Julian Jennings), & 2 Bronze in Juniors Heavyweight ( EJ and Elijah). In 2017 the same 3 students (now black belts), qualified in March in the USA Taekwondo State Qualifier sparring where Julian earned bronze in the Men's Heavyweight division, EJ won both silver in the men's heavyweight division and gold in the Juniors division and Elijah won silver in the Juniors division. The USA Taekwondo Nationals are to be held first week of July 2017 in Detroit Michigan. This is the first path for some of the team members to the 2020 Olympics. At the Four Seasons held in Whitehall OH, sice 2014, the students have now earned a combined 6 consecutive Grand Championships across divisions. 3 of those are held by Destiny Jennings. The UPMAC 2016 Nationals also saw Warrior Julian Jennings Claim Junior Black Belt Grand Champion in November 2016. Although the most pressing concern on the horizon is getting to the Nationals, it is not by any means the only financial concern that the school has. The karate academy runs on a modest budget ($32,000), funded through student dues and various fundraising efforts, including water sales and volunteering at Nationwide Arena. The academy is frugal and resourceful, and has kept a consistent student body over the years. There are nevertheless several infrastructure needs that if filled would help the school immensely. One of the challenges for the school has been the need for a reliable, consistent home for the dojo. Over the years, the dojo has moved between several different locations, including the basement of Greater Glory Ministries, Community Threads, Push Fitness, and Franklin Park. The dojo is currently housed in a single classroom in an abandoned elementary school on Atcheson. The students would benefit greatly from more space (i.e. renting a 2nd classroom) or even putting a down payment on a neighborhood house which would allow for a more stable and safe space for the academy. They are also in need of new protective gear for sparring as well as karate mats to protect from serious injury during training (they are currently working on cement floors that have only a thin layer of old carpet for protection. In addition Sensei EJ regularly provides transportation for many of the dojo’s students to practice and competitions. The academy van is now in dire need of repairs. Current mileage is at 231,978. Needed repairs include new tires, radiator, leaking head gasket, cracks in front windshield, inside paneling on doors, front passenger window broken/door unable to open from inside, side rear doors broken and unable to open, and rear doors broken. Many of the students in the dojo come from economically disadvantaged households. Fees are modest, and the school provides alternatives for tuition (for example, volunteering to run concession sales at Nationwide Arena), but there are nonetheless cases where families are unable to pay dues. If funds allow, we would like to create a scholarship fund for those students in financial hardship. Any additional donations raised beyond the goal set to get the dojo to the Nationals would be put towards the above-mentioned expenses (space, equipment, transportation and scholarship funds). Posted by Ellis Jennings Jr.
Warriors Training Hard for USA TAE KWON DO & USA KARATE NATIONALS 2017-DONATE TODAY & SHARE!! Taran's having a lemonade stand today from 4-6 pm and Saturday from 11-1 pm. Come support his efforts to raise money for the Warriors. Thanks! Friends, this is a documentary I have put together about Taran's karate dojo, which serves primarily under-privelaged minority kids in the Near East neighborhood of Columbus, OH. We are fundraising to support the students' journey to the USA Karate Nationals which are the qualifiers for the 2020 Olympics. Please take a few minutes to watch the video and learn more about the Warriors and their Sensei, Ellis Jennings Jr. Any contribution, no matter how small, is appreciated more than you can possibly know. Thank you all in advance! Our Next Phase is Protective equipment & USA Karate Nationals Registration fees for up to 16 students. We Aim to have these paid for (estimated $5000) by end of June, That way we only would have expenses (lodging, transportation & food) to focus on in 3 weeks of July leading up to event. Thank you Donate whatever you are able and please Share! LISTEN TO BIG BINK ON POWER 107.5 Tonight June 15th for Warriors Update!! USA Karate Patches are in and all 16 students USA Karate Memberships have been paid. Currently focusing on registration fees by end of June and protective equipment roughly $250/student. Thank You! IResolve Fitness and other organizations we forgot to mention. Warriors have partnered with IResolve Fitness last four years on Thanksgiving serving Dinner to the Homeless or those needing company and a home cooked meal. Thank you for all the work that you do to support these kids! Good luck ~ great work! Your doing great things out here!